Most of us didn't try for the OpenGL Programming in C# but it is one of the key area in graphics programming. In this post I will take you to the tour of OpenGL and C# programming. Solar System is simple and base for all our OpenGL programming and so do we have for OpenGL and C#. 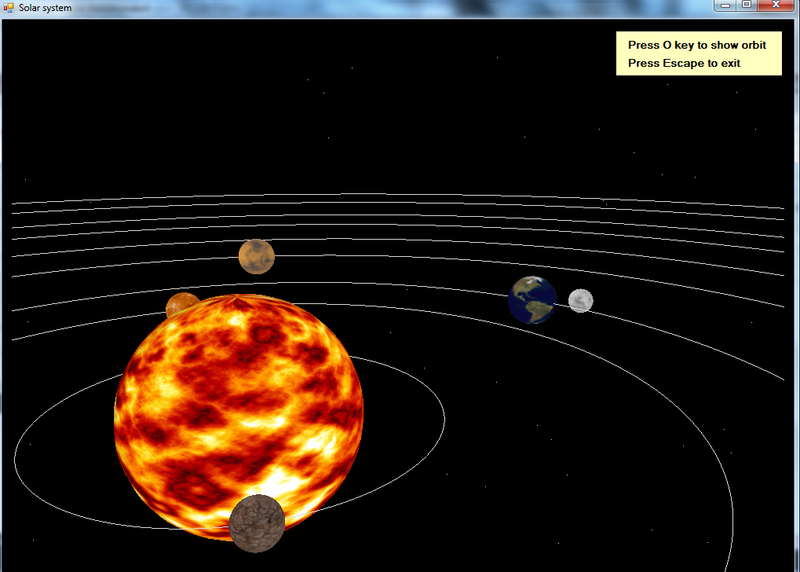 The 3D solar system implementation with OpenGL and C#. This is created by programmer name - Vasily Tserekh who had made it simple because it's only meant for educational purposes. It contains the sun, the planets, our moon, the planet’s orbit and some stars. It is programmed in Microsoft Visual Studio, utilizing the TAO namespace and the .NET Framework with Shadowengine. Download the OpenGL C# Source code and read more about the Program and it's implementation.